I hate unwanted Notification icons. I can't find any Option that will get rid of the Outlook icon. Outlook has two icons it adds to the notification tray: the Outlook icon and the New unread message envelope icon. The envelope icon can be disabled in Options but the Outlook icon cannot be disabled, only hidden. The Outlook icon will change throughout the day, so you can see at a glance what Outlook is doing. The mail sync icon shows you when Outlook is checking for new mail, the 'working' or 'alert' icons display as needed, the offline icon if Outlook is offline, and the gray exiting icon when Outlook closes slower than expected. 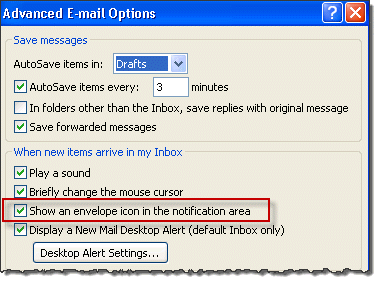 In Outlook 2010 and up, disable the New unread message envelope icon in File, Options, Mail, Message Arrival section. 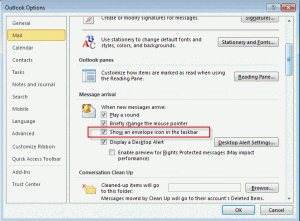 In Outlook 2007 and older, you can disable the New unread message envelope icon in Tools, Options, Preferences, Email Options, Advanced Options. The Outlook icon cannot be removed from the notification tray area, only hidden in the overflow area. 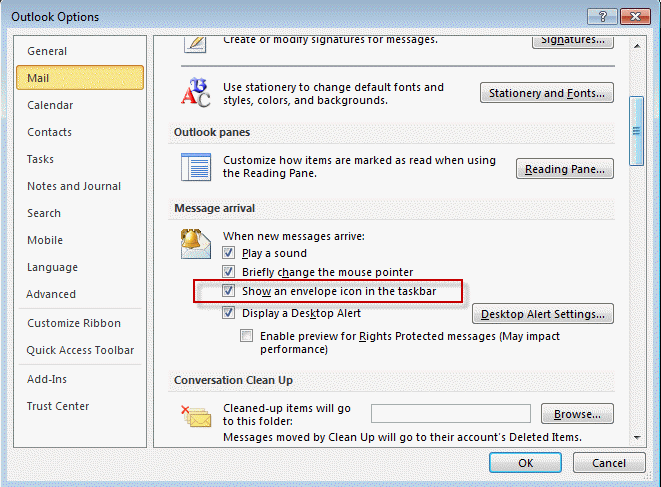 Right-clicking on the icon offers several useful options, along with the option to hide Outlook in the notification area when minimized. Exchange server users can hold Ctrl as they right-click for additional troubleshooting options. If you minimize Outlook to the tray, you'll reopen it by clicking on the icon. To hide the Outlook icon, expand the overflow and click Customize then select Hide icon and notification. To hide the Outlook icon, right-click on Windows Task bar and choose Properties. Make sure "Hide inactive icons" is checked. Click the Customize button and set the Outlook icon to "always hide". Published May 7, 2012. Last updated on May 7, 2012.